Soups and stews are the epitome of comfort food to me. There’s something about a steaming bowl of soup with the aromas wafting in front of my face that brings me so much joy. I even have a happy soup song I sing (and sometimes there’s a dance to go along with it). 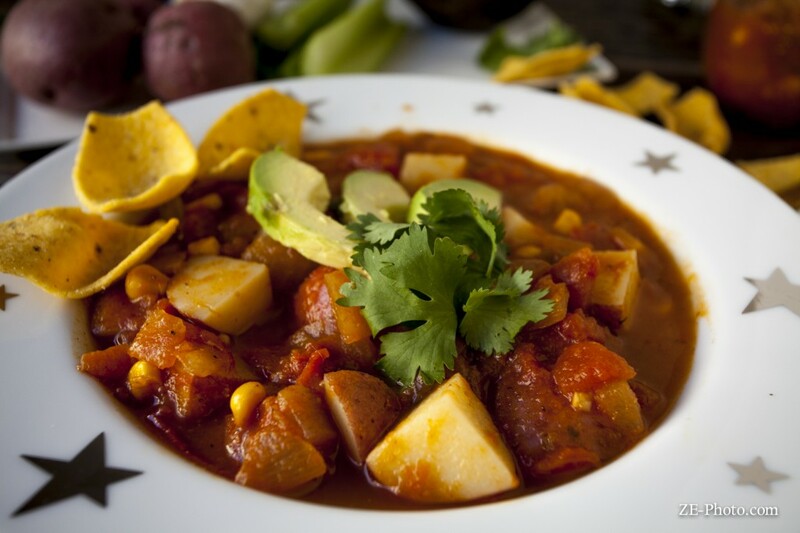 Tortilla, lentil, tomato, black bean….if it has the word soup after, I’m probably going to be all over it. The thing is though, making soup rarely crosses my mind. I’ll order it in restaurants, happily eat my mom’s split pea or my stepmom’s lentil, but when it comes to creating my own I just…don’t. Until now! I was hankering for a hearty, spicy potato stew so figured, what the hell. I even sang the song as I was walking around the grocery store gathering ingredients. 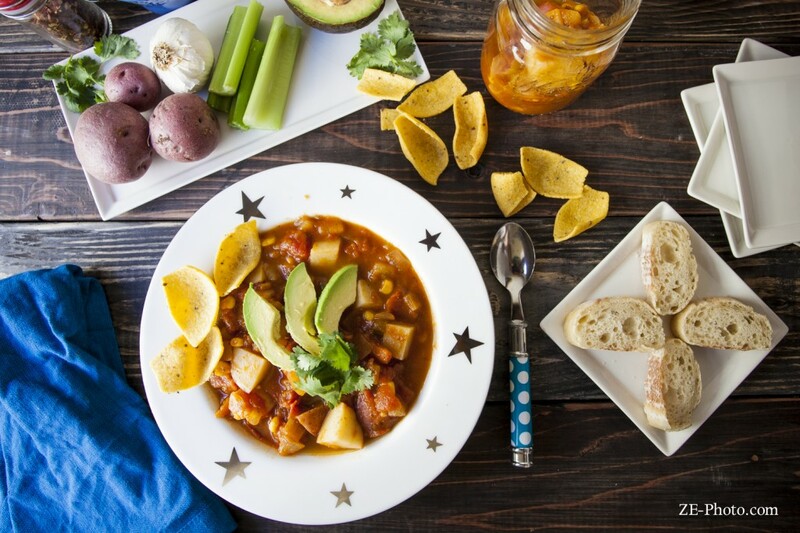 This stew is hearty and filling with a nice little kick. Full disclosure: my version did not have carrots because the husband is allergic, but I am adding them to the ingredient list because I believe they would give this stew the touch of sweetness I felt it was lacking. Feel free to leave them out. 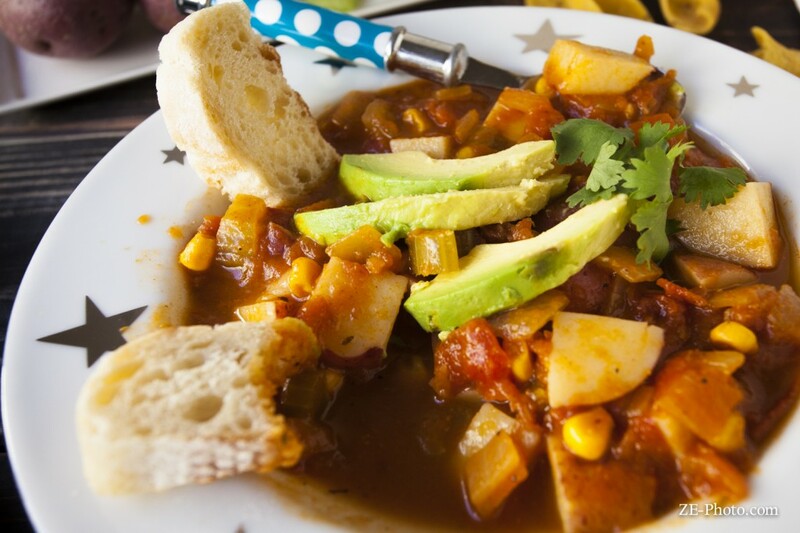 Or hell, feel free to put in whatever veggies you want – this recipe is pretty adaptable. You can also adjust the level of spice by tweaking the amount of chili powder. Want it REALLY spicy? Add a bit of cayenne too. I had to keep mine a little milder than I would have liked because again, the husband, not a fan of spice. 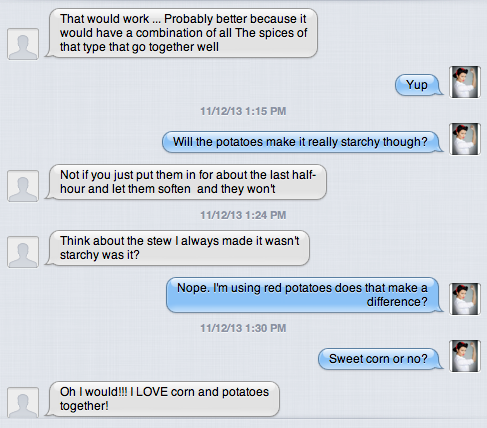 Being that I have never made a successful stew before and the last attempt was so long ago (before my vegan days), there was a lot of texting back and forth to my ultimate food guide – my mom. She’s always the voice of reason when I inquire about combining flavors that probably shouldn’t go together or what would be a tasty addition. I was pretty stoked about this stew when all was said and done. You can serve it up with baguette slices or corn chips (for a gluten-free version). I topped mine with avocado and cilantro, but I imagine this would be pretty fantastic with a drizzle of cashew cream too! This recipe makes a huge pot so you can eat it all week or freeze some of it for later. I was definitely doing the happy soup dance when I was done eating! What dish makes you so happy you want to sing & dance? ?